The relationship between the Homeric epics and archaeology has long suffered mixed fortunes, swinging between 'fundamentalist' attempts to use archaeology in order to demonstrate the essential historicity of the epics and their background, and outright rejection of the idea that archaeology is capable of contributing anything at all to our understanding and appreciation of the epics. 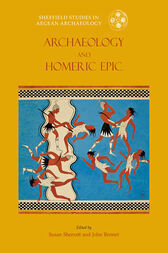 Archaeology and the Homeric Epic concentrates less on historicity in favor of exploring a variety of other, perhaps sometimes more oblique, ways in which we can use a multidisciplinary approach – archaeology, philology, anthropology and social history – to help offer insights into the epics, the contexts of their possibly prolonged creation, aspects of their 'prehistory', and what they may have stood for at various times in their long oral and written history. The effects of the Homeric epics on the history and popular reception of archaeology, especially in the particular context of modern Germany, is also a theme that is explored here. Contributors explore a variety of issues including the relationships between visual and verbal imagery, the social contexts of epic (or sub-epic) creation or re-creation, the roles of bards and their relationships to different types of patrons and audiences, the construction and uses of 'history' as traceable through both epic and archaeology and the relationship between 'prehistoric' (oral) and 'historical' (recorded in writing) periods. Throughout, the emphasis is on context and its relevance to the creation, transmission, re-creation and manipulation of epic in the present (or near-present) as well as in the ancient Greek past.